Both these root terms have their origin from the Greek language and mean "wing". In human anatomy the most common use of this root term is in the word [pterygoid]. Since the suffix [-oid] means "similar to", the word pterygoid means "similar to a wing", or "wing-like". 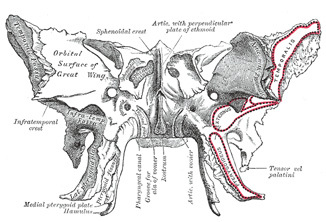 On the inferior aspect of the sphenoid bone (os sphenoidale) there are two very thin bat-wing-like bony appendages that are called the lateral and medial pterygoid plates. The medial pterygoid plate has a hook-like bony appendage called the hamulus (Latin: little hook). Related to the pterygoid plates are the lateral and medial pterygoid muscles, both these muscles aid inthe process of mastication. The root term [pter-] can be found in words such as [pterodactyl] meaning "winged finger", it refers to a phrehistoric winged animal; [pteranodon], and [pterosaurus].